SAP standard delivered Total Compensation Statement (TCS) is different from the Compensation Review Statement (CRS). The Compensation Review Statement was ment to act like similar to a merit slip, showing your employee his/her recent performance merit increases, bonuses, and stock option awards. It is only available via ECC transaction, so would need to be printed by HR or someone with ECC access on the behalf of the employee. The Total Compensation Statement, on the other hand, are available in both ESS, MSS, and ECC. The employee could log directly into his/her ESS and view his/her Total Compensation Statement at any given time. 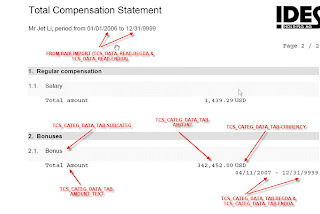 The out of the box functionality of the Total Compensation Statement (TCS) is to read off the payroll cluster. So upon each payroll cycle, the information will be available to the employees of his/her period to date earning information. What you need to do first if do the standard configuration for TCS. 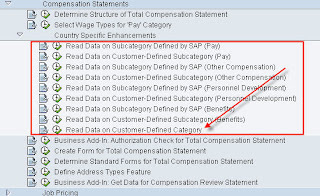 Define your category and sub category in the IMG configuration "Determine Structure of Total Compensation Statement". Don't configure the "Select Wage Types For Pay Categories" yet, this is restricted to one category. It is program to hard code in the category "PAY". In the event you define your own category, you might define more than one. You need to make a copy of that table and add a Category field. Now we are ready to use the BADI! The BADI structure will import in several key fields you need to make use of. Using the CATEG and SUBCATEG_TAB, have it look up the "Z" table you've copied earlier. It will link to a list of wage types you've configured should be tally up for that sub category. Once you know the wage type, have the BADI code go look at the custom infotype or table you've created to store the inbound payroll data. Keep in mind I had mention earlier, as part of the inbound feed from outside vendor, you need to link each of the pay component to a wage type. This is the only way you could determine what pay component belongs to which category. You could use this menthod for inbound benefit data, redirect compensation information from infotype 0759 or infotype 0015, etc. In the "Z" table, you could even have a sub category link to a wage type on infotype 0015. I would love to hear feed back or questions anyone has. I've been getting a lot of emails from other posting with questions. I'm doing some teste here with benefits, but when I run the TCS I can see the Plan but the cost are always 0,00. Do you have any idea? Where are this information comming from? I have looked on the Payroll RT Table and the Wage type assigned to the plan is there. Thanks a lot and your blog is very usefull ! Is it possible to print salary increased and bonus (customized smartforms) from ESS ?